Our resort sits on a bluff overlooking the White River and provides incredible river views. Less than 6 miles to downtown Eureka Springs,we are close enough to easily enjoy all Eureka Springs has to offer. Perfect for romantic honeymoons, family reunions, weekend getaways, corporate retreats, and amazing vacations. In addition, our lodging provides beautiful views of the White river, valley, and the Ozarks. All cabins, except for the Minnow Bucket, and The Paddler, have private outdoor jacuzzis. Each cabin is positioned for complete privacy on your deck, and offers amazing romantic getaways. All cabins have custom-built furniture throughout. 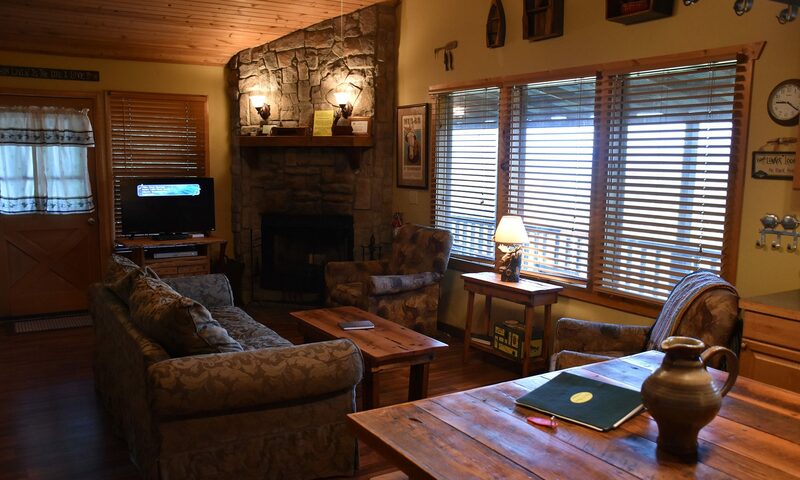 Our cabins also have wood burning fireplaces, gas grills as well as indoor Jacuzzis, and covered decks. Luxury throws, full kitchens, Dish TV , DVD/Blu-Ray players and Free Wi-Fi. The outdoor decks are great for viewing incredible, Ozark Mountain sunsets. Mornings often deliver a feeling of being “above the clouds” when the river produces an amazing fog blanket. The homes have game rooms with slate pool tables and a Foos Ball tables – for family fun. Our resort offers the perfect stay for romantic getaways as well as larger gatherings. Children and the furry members of the family are welcome as well.